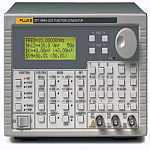 The 271 is a high performance function generator using Direct Digital Synthesis techniques. A wide variety of standard waveforms are provided and an arbitrary waveform capability allows it to be used to generate non-standard and user-defined waveforms. Extensive modulation capabilities make this a highly versatile signal source. WaveformsStandard waveforms are sine, square, positive pulse, negative pulse, triangle, ramp up, ramp down. Additionally arbitrary waveforms, multi-level squarewaves, waveform hopping and pseudo-random noise can be generated.